In this part, we will add health and damage to our player. Unfortunately, we won't get to test it completely until we add enemies in the next part, but feel free to revisit this section after having completed the next. The last thing we need to do is empty the heart sprites in the HUD when the player loses health. Setting this machine's source to Embed will allow us to refer to objects in the same scene directly, without having to use variables. This is convenient to get a reference to all our heart images. Be aware though that we are only able to do this because we are only using this graph once, on this object, which isn't a prefab. In the graph, we will iterate over each of the heart objects in the HUD. If the health of the player is greater than the index of the heart, it should display as full. Otherwise, it should display as empty. You can easily find the List of Game Object literal by typing List of Game Object in the fuzzy finder. Otherwise, look under Codebase > System > Collections > Generic. 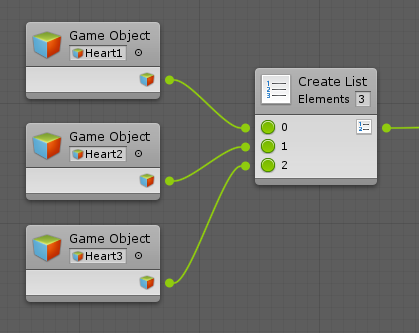 After creating the literal unit, add three items, and select each heart object in order in the fields. Let's recap what's happening here. For each heart object, we check its index. The first will have an index of 0, the second 1, the third 2. Note that in scripting, indices are always zero-based, which is why they're 0-1-2 here, not 1-2-3. We get the player health with our singleton scene variable. If the health of the player is greater than the index of the heart (e.g. 2 HP > index #1, i.e. the second heart), we enable the full sprite. Otherwise, we switch to the empty heart sprite. From this point on, everything we do is in preparation of the next part: enemies. We won't get to test it until then, so pay close attention! Now let's practice by creating our first state machine! For now, we'll focus on this state which will do most of the damage handling, and then we'll add the invulnerable state later. Double-click the node to get inside the Vulnerable state. While all flow states start with On Enter State, Update and On Exit State, you don't have to use these events. In fact, for our vulnerable state, we will use none of them, so you can go ahead and delete them. After updating the health variable, we'll check if it reaches zero, meaning the player should die. If it dies, it will send itself the Death event that we implemented earlier for spikes. This will reload the current level like before. If it doesn't die, we'll trigger a Hurt animation in the animator. We will also trigger a Hurt custom event, which we will use to transition to our invulnerable state in the next step. The first thing you'll notice is that our transitions are yellow and that the invulnerable is dimmed out. This is because we haven't told Bolt when to transition from one state to the other. Note that playing with the health value in the inspector right now will not trigger the Hurt or Death events in our player health machine, because we're directly changing the value instead of using our Damage event. In the next part, we will create enemies that call Damage on collision with the player, enabling us to fully test our health mechanic. I got the same problem as you. Can't see the List of Game Objects. Yep, can't find it as well. Stuck at this step. This was fixed in v.1.3. However, if you are targetting an AOT platform, it will still not appear, because generic lists are not AOT-safe. Hopefully this helps. Collections>List. Create List worked for me. I think it changed a bit with the updates. Did you manage to get this to work with the manual change of the health integer value. I followed you use of the game objects for the hearts but cant get the manual changing of the integer to affect the HUD. Why the Index of my list is 3 instead of 2. I got it, i should use body output instead of Exit. What If we wanted to do this with a slider instead? I tried starting a timer in the Invulnerable state to then trigger a custom event to work around it, but that didn't work, since WaitForSeconds should be in a coroutine. If anyone else is having issues with that (since the guide wasn't updated yet at the time of posting. Connect timer output to "Trigger Transition"